I have a problem on the "vison" exitation in the Z2 RVB state. The vison exitation is a topological exitation of the system like topological defect in nematic liquid , if I got it right. Because the valence bond is nematic ,it gives out the Z2 group. From Fig.1 I can not see why there is a vison on the red spot! And where is the vison in Fig.2? Fig.1 The dashed red line represent `branch-cut' emanating from the center of the vison. Fig.2 The dashed line is a branch cut as in Fig. 1. The Z2 gauge ux is now contained in the hole of the torus and so has little in uence on the spins. 2,How is the cut line ended? Vison to Vison? Or vison to itself? 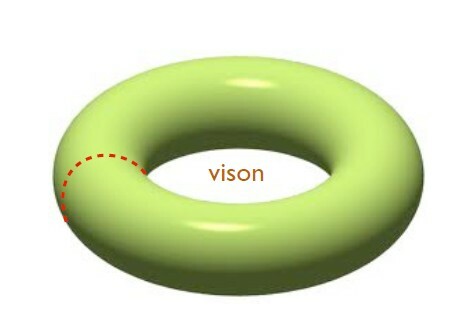 The red line here is a closed cut line on a torus, while in fig.1 the cut line is not closed. How will the cut line in Fig.1 closed? I guess it will end at another vison, maybe there are some doubling rules like other topological defects in 2D. If this is the story ,then how could this be equal? Does it means the cut line begin and end at the same vison? If it is the case the systems with even and odd visons is topological distinct. But the vison is mentioned as an excitation,so we can add visons on the ground state. If this is true ,the system will in different topological state if there are even or odd vison excitation. Is this picuture ture? Or I just get it wrong? 3,How did the flux transfer? And how the flux in the triangle lattice in Fig.1 turned into the flux though the hole of the torus? Did I miss something? 4,Why Z2 RVB sate does not have gapless edge state? Z2 RVB state is long range entangled ,topological nontrivial state.For general argument，topological nontrivial state have to close the gap to transfer into a topological trivial state-the vacuum！Where is the edge state of the Z2 RVB state? See What is a resonating valence bond (RVB) state? for a related discussion. 2+1D Z2 RVB state is described by a Z2 gauge theory at low energies. A vison is simply the Z2 gauge vortex/flux. It is a defect in the phase change/twist of the ground wave function. It is hard to present it in your first picture which is classical and does not show the phases and superpositions of the wave function. When we add one vison to this system, the flux becomes 2Pi which can be gauged away, so the system is topological trivial! But if this is true, the topological phase is not stable unless it is impossible or cost much energy to add/excite another vison. Did I get it wrong again? You said that “Not all topologically ordered states have gapless edge excitations”. And Z2 RVB is an example! But, Why? The general argument seems reasonable. Will you please tell me where the problem is? (1) "So the position of the vison and the cut line depend on the gauge". The position of the vison does not depend on the gauge. The position of the cut line depend on the gauge. (2) vison = Pi flux. (3) If vison exists, the system is topologically non- trivial. (4) there is no general argument suggesting that Z2 spin liquid has gapless excitations. There is no general argument suggesting all topological ordered states have gapless excitations. If a system has gapped bulk state and gapless edge state， and the if the gapless edge states are robust against any purterbations, than the bulk state must have topological order. 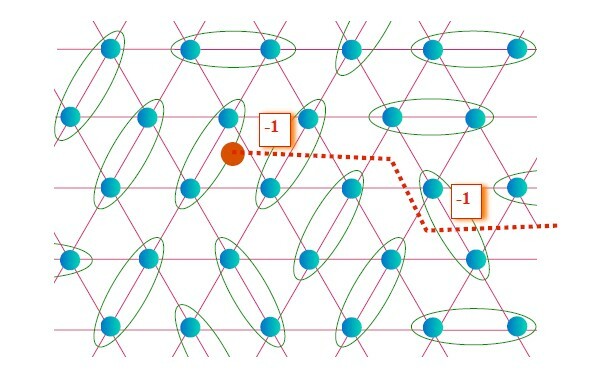 Symmtery protected topological systems do not have this knid of topological order since their gapless edge states are not robust against any perturbations. In fact Symmtery protected topological systems has no non-trivial topological orders. There exist a phase where the cut cost zero energy. We call such phase Z2 topological phase.